Blues and Americana mix perfectly in this catchy track, out now! Molly Hanmer & The Midnight Tokers are a quartet based out of Los Angeles, CA that are ready to make you stomp your boots on the floorboards and clap along to their latest single, “Fool’s Run.” The track is a groovy mix of blues guitar, Americana attitude, and a pinch of rock influences and some psychedelic folk tossed in for good measure. The end result is a catchy four-minute track that would fit in any dive bar in the USA, or any movie whereaction is about to break out in the next few scenes. 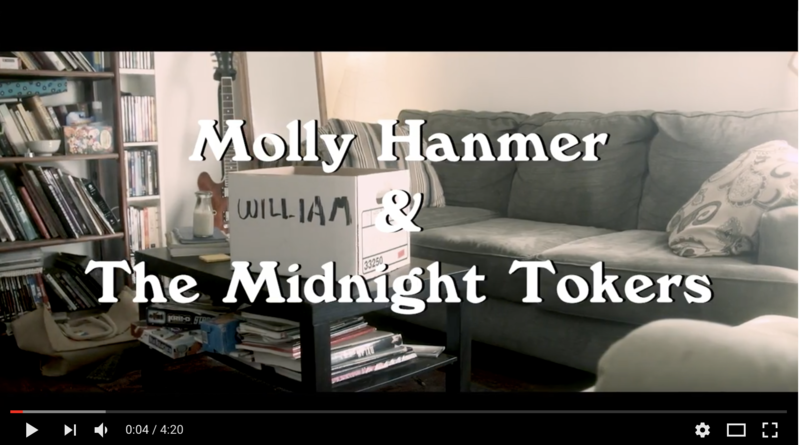 “Fool’s Run” is the first single off Molly Hanmer & The Midnight Tokers’ debut albumStuck in a Daydream, due this October. The album was produced by Marvin Etzioni (co-founder of Lone Justice; who has produced/played on albums by Peter Case, Stephen Stills, Judy Collins, Bob Dylan, Lucinda Williams, Keith Richards etc.) and was engineered/mixed by 2-time Grammy winner Sheldon Gomberg (Ben Harper, Ryan Adams, Lucinda Williams, Rickie Lee Jones). “I wrote Fool’s Run in Monterey after returning from a solo trip to Ireland. I had just ended a 5-year relationship and was planning a move to L.A. so change was afoot. I’d had this major realization that I had been taking care of other people but neglecting my own life and I was ready to change that. As I sat down to write I thought the song would just flow out of me to match my sense of inner knowing but instead, I wrestled with it, as I had wrestled with these ideas my whole life. Ultimately, Fool’s Run became my anthem, a declaration of sorts that I could ‘sing a different song’, my own.” – Molly Hanmer. Americana influenced singer-songwriter/guitarist Molly Hanmer is originally from Pacific Grove in Monterey County. Molly started playing solo gigs in San Francisco and Monterey and a short time later she had a serendipitous encounter with Claudia Miles, a former industry professional with a passion for music. Even though they were years apart in age they found themselves to be kindred spirits and had a lot in common when it came to music. Claudia instantly sensed Molly’s talents on guitar and harmonica but discovered that she wasn’t finishing her original songs. She was writing, but kept deciding they weren’t good enough and tossing them out as useless ideas. Encouraged by her friend, Molly began to finish the songs she had started, and it was then that their partnership began and Claudia became her manager. Molly finally made the move to L.A in 2014, and together they launched her music career. Soon after moving, Molly formed a band which was to be dubbed, “Molly Hanmer & the Midnight Tokers.” Being millennials, Molly and her bandmates didn’t notice the connection to the Steve Miller song “The Joker” (“I’m a smoker, I’m a joker, I’m a midnight toker”). But it has since provided plenty of in-jokes and is also fodder for some merch. In July 2016, Molly was introduced to producer Marvin Etzioni. Marvin loved Molly’s songwriting and guitar playing and was eager to work with her. After that first meeting, Molly knew it was a perfect match. Next, they chose critically acclaimed producer and engineer Sheldon Gomberg who most recently had worked with Ben Harper. It was a dream team to be sure. After a year in pre-production, production, and mixing, the team emerged with Stuck in a Daydream, Molly’s extraordinary debut album. The production and recording process was wrapped up earlier this year, and the album Stuck in a Daydream is slated for a late October release of this year. The band is now formed by vocalist/guitarist Molly Hanmer, keyboardist John Bird, bassist Graham Chapman, and drummer Keith Palmer.